WHW & Associates worked closely with Bank Negara Malaysia in their effort to consolidate its visual identity programme. The process took place over three stages (from 2000 to 2014), with each stage focusing on specific issues related to the Bank’s identity, as well as managing changes that have taken place over the ensuing years. Stage I covered the following areas: Research and visual audit; Redesign of the logo and core elements; Rationalisation and streamlining of department logos; Merchandise, and production of the Bank’s first Visual Identity Guidelines Manual. This phase concluded with a brand internalisation workshop with senior staff members. During the audit, we came across departments that created their own logos for their social activities (e.g. sports club, fundraising events, etc), sometimes distorting the Bank’s official logo or adding caricatures around it. The Kijang (mousedeer) symbol depicted in the logo was drawn by an artist in 1964. It had delicate proportions and a lively character. Since then, the Kijang was redrawn several times as printing technology advanced, from film and bromide to digital, resulting in a mutated Kijang due to previous designers’ lack of attention to details. 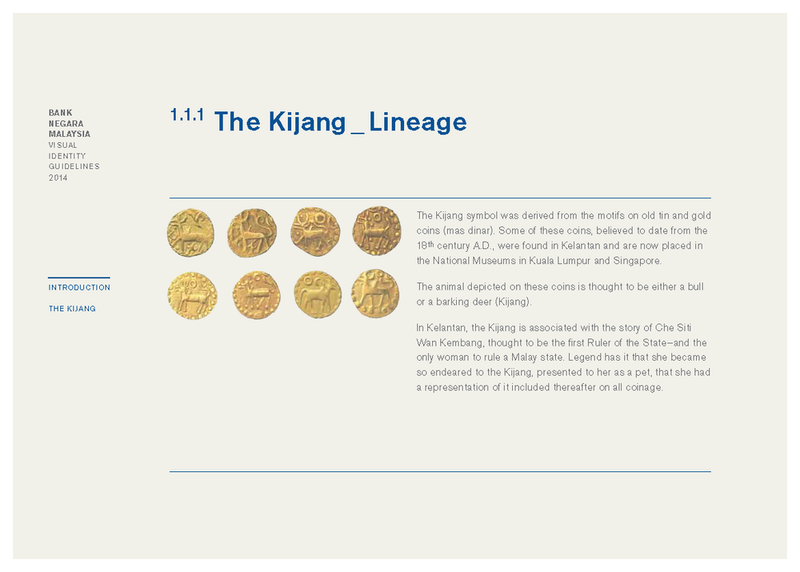 During the visual audit, we found many versions of the Kijang symbol—some with an open mouth, others closed; some with its rear-end rounded, others flat. During the course of Stage 1, there were also many other changes implemented by different design teams, from the building interiors to exhibition design. 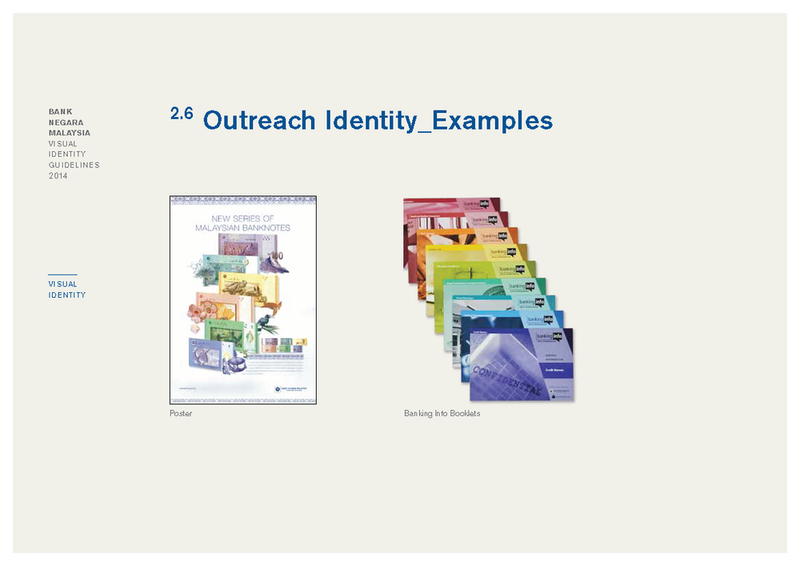 We provided interim guidelines while these were being executed, and also documented and included the elements that worked within these various initiatives into the identity system. The cold grey monolithic exterior of the Central Bank of Malaysia building in Kuala Lumpur belied the lively and colourful interiors that were being installed. Stage 2 focused on drawing up a communications strategy for Bank Negara in its interaction with its two diverse audiences: professionals and the public (including teens and rural folks in the villages). The OneVoice Strategy was developed to help Bank Negara maintain an authoritative stance (the Core identity) even as it adopts a friendly and approachable manner (the Proactive identity) in dealing with its audiences. Guidelines were developed for Exhibitions, Publications, Powerpoint Presentations, Advertisements and Collaterals. Stage 3 incorporates both the Core and Outreach* identities for communications. An updated Brand Architecture and Visual Identity System was applied to communications, new buildings, and divisions. The Visual Identity Guidelines Manual that we created twelve years ago was given a thorough overhaul to keep up with the changing times. Among many collaterals, attention was given to the Bank’s gift wrapping paper as it plays host to many VIPs, dignitaries, and business partners from across the globe. The gift wrap we designed in 2002 (above) was replaced by a set of three, with motifs taken from the Malaysian currency notes.